The gloves are off, and graphics card maker AMD has called out rival nVidia on its claim of making the fastest video card in the world. In a video posted yesterday, nVidia, one of the leading makers of graphics cards used in PCs, claimed that its new product, the GeForce GTX 590, is the "World's Fastest Graphics Card." AMD, nVidia's primary rival in high-end graphics cards, says that title belongs to its newest product, the Radeon HD 6990 and is challenging nVidia to put up or shut up. "When we launched [our card], we issued a press release in which we proudly called it the 'World's Fastest Graphics Card' and fully disclosed the basis upon which we made that claim," reads AMD's official blog. "Yesterday, our competitor also issued a press release, announcing the launch of what they claim to be the 'World's Fastest Graphics Card'- the Nvidia GTX 590. We combed through their announcement to understand how it was that such a claim could be made and why there was no substantiation based on industry-standard benchmarks," wrote AMD's Dave Erskine. He then issued nVidia a challenge: Show us your proof. Give us the numbers that show the GTX 590 is faster then the Radeon 6990. 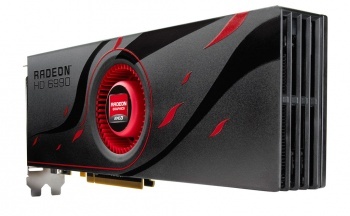 "As it stands today, leading reviewers agree with us that the AMD Radeon HD 6990 sits on the top as the world's fastest graphics card," he wrote, citing several benchmark test results. No word yet from nVidia, but I must say it's rather refreshing to see such blatant rivalry after putting up with years of the snide, backhanded sniping between certain console developers.